Te Puia, located in the Te Whakarewarewa Geothermal Valley at the edge of Rotorua features Pohutu Geyser and is home to the impressive New Zealand Maori Arts and Crafts Institute. Visitors can tour the bubbling mud pools with a local Maori guide and choose from among myriad activities. Admission tickets and guided tours through Te Puia usually include a visit to the Kiwi House for a look at this nocturnal national bird housed in a dark enclosure. In the national weaving and carving schools, you can watch Maori students re-create the traditional arts of their ancestors. For what is arguably the best evening in Rotorua, come in the evening to experience Te Po—a traditional ceremony and hangi feast (food cooked in a traditional in-ground oven), along with a music and dance performance. Travelers can also visit Te Puia as part of a Rotorua sightseeing tour, an eco tour, or an excursion focused on arts and crafts. Admission fees vary, depending upon the length of stay and various activities involved. Child pricing, day passes, and family passes are available. It’s best to bring sturdy footwear for a walk around the hot springs. The site offers wheelchair-accessible parking, restrooms, and asphalt pathways; however, some of the pathways are steep and visitors with limited mobility may require assistance. Only five minutes, or 2.2 miles (3.5 kilometers) south of central Rotorua by car, Te Puia is reached directly from the i-Site Visitor Information Centre via Fenton Street and State Highway 30. The attraction can also be accessed from the Tauranga port via State Highway 36, which takes about an hour. Most tour operators offer round-trip hotel transport. Te Puia is open from 8am to 5pm daily, with evening operating hours from 6pm to 9pm. It’s best to arrive early to make the most of your time, but tours run until one hour before closing. Book an evening visit and you’ll be treated to a tour of the geothermal area under colorful lights. When visitors first catch a glimpse of Pohutu Geyser—which thunders up from the earth and shoots skyward with a column of water that’s nearly 100 feet (30 meters) high—they begin to understand why this geothermal attraction has drawn people for centuries. You can witness the eruption of the Southern Hemisphere's largest active geyser day or night. Explore the Shire and Middle-Earth on this full-day Hobbiton and Rotorua tour from Auckland. Travel through Waikato with a guide and admire panoramic views over the Hauraki Plains. Enjoy a guided tour of Hobbiton — made famous in the ‘Lord of the Rings’ and ‘The Hobbit’ movies. Learn how the set was created, and discover sites you love including the Hobbit holes, Green Dragon Inn and the Mill. After lunch in Te Puia, head into the geothermal Te Whakarewarewa Valley where shooting geysers, bubbling mud pools and steaming hot springs await. The Waitomo Caves and Rotorua rank among New Zealand’s top attractions, offering natural beauty, geothermal features, and native culture in equal measure. Ideal for travellers short on time, this adventurous tour takes in both sites in the same day, with entry fees plus pickup and drop-off at selected Auckland hotels included. Discover subterranean stalagmites at the famous Waitomo Caves and hit top Rotorua attractions including the Government Gardens and Lake Rotorua. This full-day itinerary combines two North Island destinations: Waitomo Glowworm Caves and Rotorua. Marvel at the tiny lights of thousands of glowworms on a boat ride through the tranquil caverns. Then choose from several Rotorua attractions, including an Agrodome farm tour, Skyline Gondola ride or Polynesian Spa experience. In the afternoon, visit Whakarewarewa Thermal Reserve and the Maori Arts and Crafts Institute at Te Puia. Picnic lunch and round-trip hotel transport are included from Auckland. Experience an evening of authentic Maori food, movement, and music paired with the raw power of the Pōhutu geyser with a night at the Te Puia cultural center. Watch an energetic performance inside a carved Maori meeting house, followed by a delicious ‘hangi’ feast prepared in a traditional pit oven. Later, venture into the geothermal valley to sip hot chocolate under the stars and watch the eruption of the Southern Hemisphere's largest active geyser. This is an independent three day tour departing Wellington daily with two nights in a 4 - 4.5 star accommodation in Rotorua prior to your tour concluding in Auckland on day 3. The tour includes a full day in Rotorua with admission and tours of the Agrodome, Rainbow Springs and Te Puia. On day three the tour travels to Auckland via Waitomo where you will experience a guided tour of the glowworm caves. Hotel pick-ups and drop-offs are included for all transfers and activities listed. Explore Rotorua and the otherworldly Waitomo Caves on this 12-hour private tour from Auckland. With your dedicated guide, travel in a private vehicle to the Waitomo Caves. Walk through the impressive underground caverns, filled with unusual rock formations. Take a boat trip through the Glowworm Grotto to see the tiny, phosphorescent creatures light up around you. Continue to Te Puia, a traditional Maori village, and Te Whakarewarewa, a geothermal valley filled with mud pools and geysers. Enjoy personal attention from your guide and the ability to modify your itinerary on this private tour. Light refreshments and round-trip transportation from Auckland are included. Combine three of Rotorua’s top attractions with a Hobbiton Movie Set tour on this full-day adventure. In the morning, visit Te Puia Maori Arts and Crafts Institute, Rainbow Springs Wildlife Park, and the Agrodome sheep farm with a knowledgeable guide who informs you about New Zealand’s indigenous culture, national kiwi bird, and most common farm animal. Then travel through 'The Shire' on a tour of filming locations used in ‘The Lord Of The Rings' and ‘The Hobbit’ series. Take in two of New Zealand’s top attractions in one day on this Rotorua and Waitomo Caves day trip from Auckland. Visit Rotorua with a guide and take in key sites including Te Puia and the Maori Arts and Crafts Institute. After lunch, admire fine views over Lake Rotorua on route to the famous Waitomo Caves. During your boat ride, gain insight into the caves’ geological significance and marvel at the luminescent glow worms illuminating the dark caves. Upgrade to include the Wai-O-Tapu Thermal Wonderland to your small-group tour. Gain insight into traditional Maori customs on a guided tour of the New Zealand Maori Arts and Crafts Institute at Te Puia, followed by a steam box lunch prepared the traditional way: cooked over steam vents at the Te Whakarewarewa Geothermal Valley. Walk past Pohutu Geyser, see a flax-weaving demonstration, and spot the national bird in the nocturnal Kiwi House. This small-group tour near Rotorua is limited to a maximum of 15 people for a personalized experience. 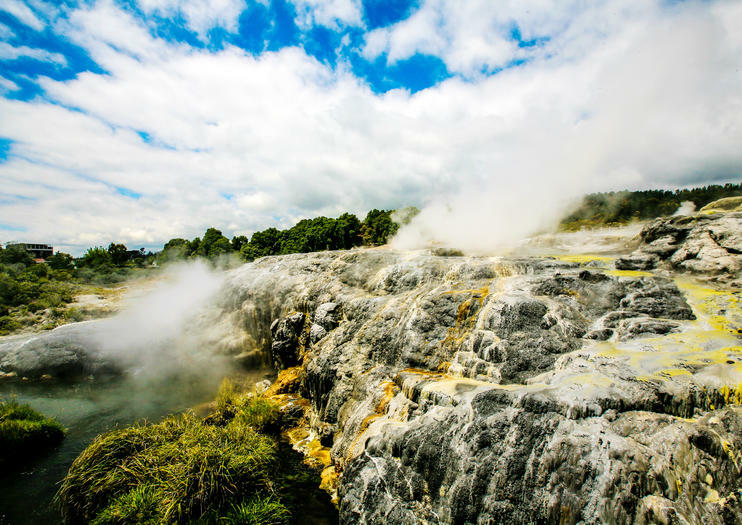 Lying to the south east of Auckland, Rotorua is a land of geothermal pools, steaming geysers, and ancient Maori history. With this tour, explore Rotorua and take in the top attractions with ease. Hop into your vehicle and spin to sites of interest such as Government Gardens, Kuirau Park, Ohinemutu, the Polynesian Spa, and the Redwoods Forest. Stop along the way to capture the sites on camera, and listen as your guide sheds light on the region’s geothermal activities and Maori traditions. Gain entry to the New Zealand Maori Arts and Crafts Institute at Te Puia on a guided tour of this geothermal hot spot. Take a walking path up to steaming vents, boiling mud pools and erupting Pohutu Geyser at Te Whakarewarewa Thermal Valley; observe the emblematic kiwi bird; and discover Maori traditions at the cultural center. Upgrade to include a cultural performance of Maori song and dance, including the warlike ‘haka.’ Showtimes are available several times a day during admittance. Discover the North Island on a 3-day guided coach tour, traveling round-trip from Auckland. Experience the magical luminescence of thousands of glowworms during an underground boat ride at Waitomo Glowworm Caves. In Rotorua, visit the Agrodome and experience geothermal wonders like Pohutu Geyser at Te Puia, then learn about Maori traditions with a cultural performance. Enjoy sightseeing at the picturesque lakeside setting of Taupo including its top attraction: Huka Falls. Two nights’ accommodation with hotel pickup and drop-off are included. Immerse yourself in Māori culture, history, and tradition during this full-day private tour to Rotorua from Auckland. Get a traditional Māori welcome followed by a cultural show at Te Puia, then continue to the Kiwi House to get a good look at New Zealand's national bird. Follow your dedicated guide through the Pikirangi Māori Village to see how the indigenous people of New Zealand lived before the European settlers arrived. Explore the mud pools and geysers in the Te Whakarewarewa geothermal valley and spend time in the Rotorua government center. Round-trip transportation from Auckland is included; all entrance fees are at your own expense. Once your cruise ship docks in Tauranga, get the most out of your time in port with this combo trip to the Geothermal Valley and a local kiwi fruit orchard. With a guide teaching you about the geology and history, explore the geysers, hot pools, and steam vents in the valley, then head to the kiwi orchards to learn about New Zealand's most famous export. Tastings of jams, juices, and different kiwi varieties included. Maximize your time in New Zealand with a full-day combo tour to two of the North Island's top attractions: the Hobbiton Movie Set and Te Puia Geothermal Park. Depart from Auckland for a scenic drive to the Hobbiton Movie Set where you get guaranteed admission and a guided tour of the famous Lord of The Rings site. Then take in the geothermal activity and Maori culture of Te Puia Geothermal Park in Rotorua. Combine the top sights of Rotorua and Te Puia in a single comprehensive day tour from Auckland. Traveling with a guide and following a carefully curated itinerary means you won't miss any of the important sights. Visit the Maori cultural landmarks and geothermal spots of Te Puia, as well as the city sights in Rotorua, accompanied by insightful guided commentary. Round-trip transportation from Auckland means you can focus on the scenery and the experience instead of driving and directions. Discover many of New Zealand’s top attractions in one day on this 6-hour private shore excursion to Rotorua from Tauranga Port. Sample kiwifruit and local wines at the Kiwi 360 Center, and admire the sandy beaches of Mt Maunganui with your guide. Travel past dense forests, shimmering lakes and rolling farmland to Okere Falls. Immerse yourself in Maori culture in Rotorua, and marvel at mighty geothermal activity at Whakarewarewa or Te Puia. See famous sites such as the Government Gardens, Blue Baths and Rotorua Museum before returning to your ship. Combine three of Auckland’s most popular day trip destinations on this tour and enjoy a personalized experience, with a private guide, 5-star accommodation, and luxury transport. Admire the underground wonders of the Waitomo Glowworm Caves; tour the Hobbiton Movie Set, where the LOTR and The Hobbit movies were filmed; and visit Rotorua attractions including the Agrodome Farm, the Te Puia Maori Village, and Wai-o-Tapu Geothermal Wonderland.